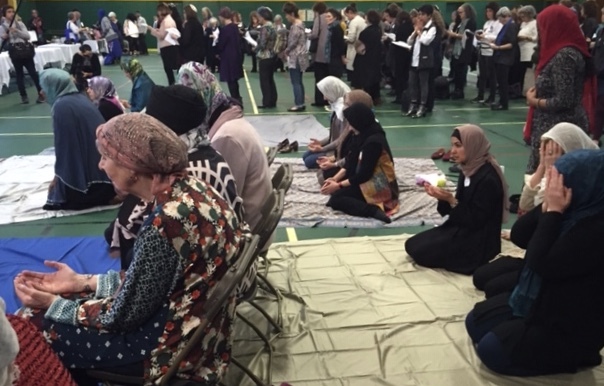 Side by side in prayer, Muslim women (front), Jewish women (back) at Sisterhood of Salaam Shalom national conference. The Sisterhood of Salaam Shalom is a North American grassroots organization bringing Muslim and Jewish women together to get to know one other and together stand up to hatred. Yet despite its mission, the organization is not getting involved with the competing Women’s Marches being held in New York (two of dozens of marches around the country) this Saturday, January 19. In the all-is-right-in-America autumn splendor of a college campus, some 600 women, some in hijab, a few in yarmulkas, had come together at the conference of the only American organization of Jewish and Muslim women and teenage girls. Galvanized by Trump’s incendiary pandering to racism, SOSS membership has more than tripled since the 2016 election. After the Pittsburgh killings, SOSS provided some comfort. Black paper strips for all were the conference equivalent of the cut black ribbon worn by Jewish mourners. We mourned the 11 Jews murdered at Tree of Life synagogue and the two African Americans gunned down six days later at a Kentucky supermarket when the white killer couldn’t get into a black church. That’s a bedrock principle of the Sisterhood of Salaam Shalom. For instance, the group has a directive: don’t try to solve the Israel-Palestine conflict till you’ve known each other for at least a year and built friendships that, hopefully, will humanize seemingly intractable political positions. And now, a new test case: the dangers for Muslim and Jewish women of taking positions on the competing women’s marches with all their attendant drama. Reading about these dueling events, I feel I’ve just sustained a punch to the gut. I wonder: is a mass movement of women of all religious beliefs, colors, ages, sexuality and classes, standing up against our racist, misogynist administration, being threatened by corrosive politics? Why come to a city that already has a locally organized women’s march and start your own instead of working to bring more women of all colors and beliefs into the local march? At least for this New York Jew, the locally organized march rallying at Columbus Circle then marching down Sixth Avenue is the one I’m going with. I’m gritting my teeth at the idea of women’s unity being threatened when we’re perilously close to losing our rights, including our rights to our own bodies. I don’t think boycotting the Women’s March or the competing rally is the answer. Judging by online comments, most women seem unaware of the competing marches or are frustrated and confused. My pre-Sisterhood self would have jumped in, criticizing the D.C. march leaders for excluding Jews from the original leadership then reportedly trying to move in on the local New York leadership. But wait. I have decided to tread carefully. Jews and Muslims from our Sisterhood of Salaam Shalom Civil Rights Bus Trip are coming to New York City for the Women’s March and Martin Luther King Jr. Day. Some of my Muslim sisters may support the D.C. march, its local presence, and its leaders, including co-president Tamika Mallory and national march co-chair Linda Sarsour, an American Muslim of Palestinian descent. The D.C. leadership has publicly reaffirmed a welcoming stance towards Jews. Personally? I’m feeling different strokes for different folks. And now, a new coalition of Jewish Women of Color is weighing in. The group, led by Yavilah McCoy, among others, is asking all Jewish women to march (wherever we are, including in the “official” Washington, D.C. march). We are being called to join as allies under the banner and hashtag #JWOCMarching, signifying that Jewish women of color are living their lives at the intersection of racism and anti-Semitism. McCoy and longtime feminist and social justice activist Shifra Bronznick, writing in the Forward, encouraged all Jewish women to join the official Women’s March to stand up for our rights. Back to the Sisterhood of Salaam Shalom. Fortunately the organizer of our New York Sisterhood gathering is, literally, a rocket scientist. She’s laid out our personal options with precision: 1) Participate in the locally organized New York march. 2) Participate in the D.C.-linked New York rally. 3) Feel free not to participate in either. Returning to Edina Lekovic’s “Neither fight nor flight,” all of us – Muslims and Jews – will be sitting down together after the march to talk about the tough issues we’ve restrained ourselves from struggling with online. But wait – there’s more. Rev. Cathy Bristow, an interfaith minister whose mission is “relanguaging” the conversation around race and gender, came to my aid. Her advice: “Don’t say ‘competing marches’. The two marches are not competing. Women are not one concentric circle. There’s racism within that circle.” And then, her additional insight: “If there are two competing marches and you think there should be one, go with the other march.” In other words, lean in to your discomfort. I am shaken out of my position. To my amazement, I think I’ll go to the Foley Square rally. And then, another breakthrough: I’ll go to both. Wish all of us luck. Or maybe even pray for us. RSVP and information for Jewish Women marching in Washington, DC. 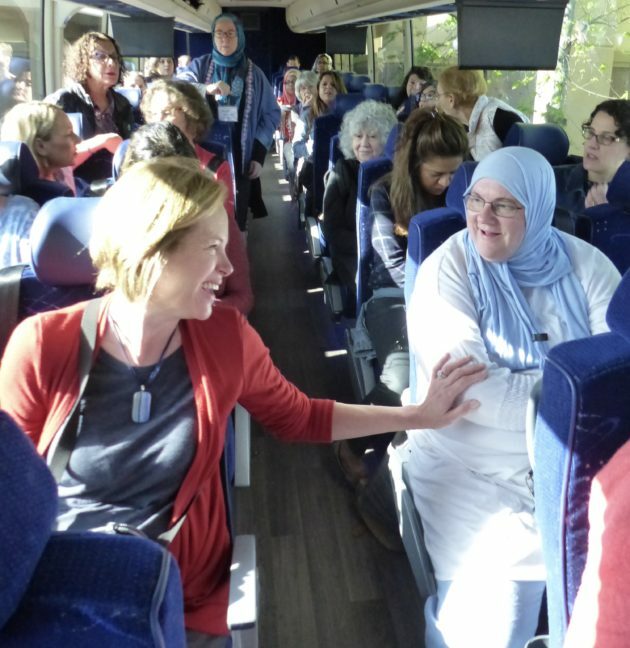 Back in April, a busload of white and brown Jewish and Muslim women, some in hijab, headed south along the civil rights trail from Georgia to Alabama to Tennessee. What could go wrong? We’re riding with Brenda, a third-generation female bus driver from Asheville, North Carolina, and Todd, our African American civil rights expert. We’re a world away from the 1961 Freedom Riders on Greyhound buses who were attacked by violent mobs for attempting to integrate Southern bus terminals. But this is also far from a Disneyland outing. We’re in the Trump era of hate with his Muslim ban and war on immigrants. We’ve signed on for the Building Bridges Civil Rights Bus Tour created by the Sisterhood of Salaam Shalom. SOSS is a national organization committed to bringing Muslim and Jewish women together to cross the religious divide by getting to know each other and, together, stand up against racism and discrimination. Women are responding. Founded by Sheryl Olitsky and Atiya Aftab in 2013, SOSS is a grassroots organization with national guidelines. Since Trump’s election, the number of chapters has more than tripled, from 45 to 145, with some 2,500 members in the U.S. and Canada. Another 2,000 potential members are interested in joining if they can find enough local women to organize chapters. The trip planners navigated the minefield of dietary requirements—kosher, halal, vegetarian, gluten-free and, out of respect for our Muslim sisters, no alcohol except for wine as part of Shabbat in Memphis. At our volunteer stint at Habitat for Humanity, Muslims had no trouble finding a place to pray on the grass before getting to work ripping out the innards of a house under renovation. Shabbat services were walking distance from our Memphis hotel. Nearly 50 women on a bus together for eight days can’t stop talking. A woman from Manila tells me, “Everyone wants to know which one I am” (Jewish or Muslim). In fact, she’s a Catholic convert to Judaism, and she’s on her iPad, preparing for her next Shabbat Torah reading. A woman in hijab from a Washington suburb tells me that she benefits from white privilege even with a head covering. She’s on a spiritual trip that’s taken her from growing up Catholic in Beaumont, Texas, where the media dubbed her alma mater “the last high school in America to desegregate.” Her husband is Turkish, an observant Muslim. It took her years to convert and even longer to cover her head. She says that as president of her mosque, she’s the only woman president her imam knows of, and she once surprised a Protestant minister by telling him a woman can be a feminist and a Muslim. Two women, one in hijab, discover they both went to the same Catholic school in a tiny upstate New York town near the Canadian border. One converted to Islam. One converted to Judaism. Their meeting on this bus is destiny. AMY STONE, the Lilith Blog. Stowe, Vt., converted to Judaism. Dorene, in Charlotte, N.C., converted to Islam. We’re riding with Brenda, a third-generation female bus driver from Asheville, North Carolina, and Todd, our African-American civil rights expert. We’re a world away from the 1961 Freedom Riders aboard Greyhound buses attacked by violent mobs for attempting to integrate southern bus terminals. But this is also far from a Disneyland outing. We’re in the Trump era of hate with his Muslim ban and war on immigrants.